The French painter and engraver CHARLES FILIGER, died on this date (b. 1863). Friend of Gauguin, he took as his method Gauguin’s use of flat color, and at times seemed to venture further into the area of decorative abstraction than the master. 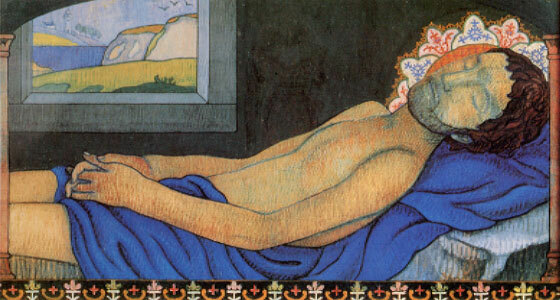 But Filiger never managed to incorporate the philosophical content that was the basis of much of Gauguin’s art. Where he succeeded in capturing some of the intensity of the religious feeling native to that part of France, he could only show the colorful patterns of Breton life. Filiger, on the other hand, was more successful in portraying the piety of the peasants. Intensely religious himself, suffering from guilt about his homosexuality, he found it far easier than his more sophisticated friends. Filiger lacked an aesthetic boldness. Rather than invent a new method of painting, Filiger preferred to refurbish the old ones. In this he bears some similarity to the Pre-Raphaelites, in that he also returned to pre-Renaissance sources for inspiration, in his case to Giotto and the Sienese. He studied in Paris at the Académie Colarossi. He settled in Brittany in 1889, where he was associated with Gauguin and his circle at Pont-Aven, but he remained a mystic and a recluse. The Breton setting, with its stark landscape and devout peasant inhabitants, provided fertile ground for the development of Filiger’s mystical imagery and deliberate archaisms. Filiger’s friend, the painter Emile Bernard, characterized Filiger’s style as an amalgam of Byzantine and Breton popular art forms. The hieratic, geometric quality and the expressionless faces in his gouaches of sacred subjects such as Virgin and Child reveal Filiger’s love of early Italian painting and the Byzantine tradition. Evident too in the heavy outlines and flat colors of his work are the cloisonnism of the Pont-Aven school and the influence of Breton and Epinal popular prints. Filiger’s landscapes, such as Breton Shore, share with Gauguin’s paintings an abstract, decorative quality and rigorous simplification.